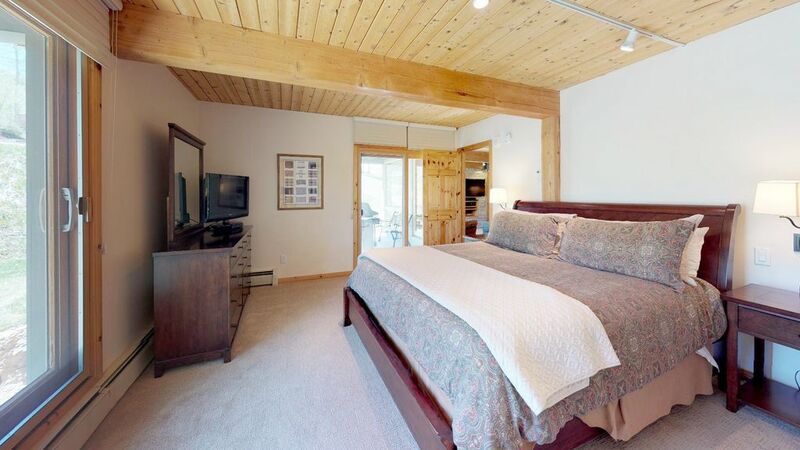 Bright, Spacious 3 Bedroom with the best ski access in Snowmass Village! The location, the amenities, the friendly staff make this place special. Everyone loves Top of the Village! Trails 104 is right on the ski slope and you really do ski right up to your patio! You also have some amazing views of the mountains. During the summer you have the patio to sit on and enjoy the peaceful Aspen trees and surroundings. This condo is ideal for families or couples. You will love it here! Historic downtown Aspen is just minutes away on the complimentary transit system. Top of the Village has all the amenities available for you to enjoy a wonderful family vacation. The Snowmass Village Mall and Base Village are just seconds away and easily accessible with the Top of the Village on call, complimentary shuttle that is available exclusively for our guests. From your living room you can see skiers coming down the mountain and the upper slopes. Trails 104 has one of the most premier locations on the Mountain. Ski right up to your patio. Just go out the sliding glass door from your living room and walk out to the slope. We supply the coffee filters, you bring the coffee. Patio off the living room and the master bedroom. Both are right on the ski slope. The best in North America! One centrally located outdoor, heated pool with changing rooms close by. The check out clean is included. Additional housekeeping services can be added for a fee. Amazing property and surprisingly private. Our first visit to Aspen in the summer, and this unit made our visit all the more enjoyable. We would highly recommend this unit to anyone going to Snowmass or Aspen in the summer or winter. Wonderful! Please come stay with us again soon. We enjoyed our stay at Snowmass. It was beautiful area and condo. We all had a wonderful time. The staff was helpful and kind. We did feel the beds were firm for what we like. We were missing some shampoo and soap in some of the bathrooms. We all enjoyed ourselves. It was great to have 3 bathrooms for all of us to get ready. Overall we had a very good experience. The condo was comfortable, well equipped and clean. The only thing lowering my overall rating is the "sleeps 8" in the advertising. This property does not sleep 8 and needs to be revised. There are beds for 6, one regular sofa, and no sofa bed. At best, it would sleep 7 if one person slept on the regular sofa. The property manager did accommodate us when we complained though and we were very well taken care of, so that was appreciated. But I was upfront when I booked the property that we would have 8 people, so I am surprised that this was not mentioned. Barton I.Where do you live? I do about 4-5 ski trips per year and get VRBO places for most of them. I can say that this was without a doubt the best I've ever experienced. Truly "ski in, ski out", just off the Village Express lift. Accomodations were top notch, very clean, very nice and stylish. Extremely comfortable, great water pressure, etc. The Top of the Village shuttle was literally a life saver. As a flat-lander, I would have had some trouble hiking back from Snowmass village to the condo the first few days, and the shuttle was so helpful and convenient. I would definitely recommend this condo to anyone. Thank you so much for sharing your thoughts and we are delighted that you enjoyed your stay at Top of the Village. We hope to see you back here next ski season! Aspens and golf at their BEST! Our trip was a family golfing and sight seeing trip. It was perfect!! The weather couldn't have been nicer our condo was perfect for three couples, it was a perfect vacation. Hope to do it again soon and at the same location. Wonderful to hear that you all had a good time at Top of the Village. Hope to see you again next year! My family just spent three nights at this condo. Everything was excellent with the exception of the mattressess on the twin beds. They were very soft and saggy and not real comfortable. I recommend these be replaced. The dishwasher worked ok but it definitely needs replaced as it is not very clean due to hard water. Other than that, the stay was most enjoyable. Thank you for taking a moment to share. I have already spoken to the manager about the beds and dishwasher in order that they both get checked and corrected. This is such a wonderful condo and we want to keep everything in it comfortable and fresh. There is a world of activities, dining, shopping, festivals and events that occur in Snowmass Village. Top of the Village is the perfect retreat to access all the splendor of the mountains and surrounding areas. A 5% Resort Fee is added on to every reservation and may not be reflected in the quote. Winter Bookings: Should you need to cancel your reservation up to 30 days prior to arrival a 10% fee is assessed on the deposit paid. If you cancel 30 days or less prior to your arrival no refunds apply. Summer and Fall Bookings: Should you need to cancel up to 14 days prior to your arrival a 10% fee is assessed on the deposit paid. If you cancel 14 days or less prior to your arrival no refunds apply.